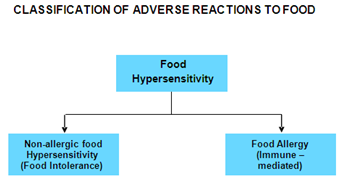 Food hypersensitivity reactions include food allergy, (caused by the immune system and food intolerance where the mechanism of the reaction is not based on the immune system. Food allergy is further divided into the more common “typical” immediate type (IgE-mediated) food allergies, and the rarer “delayed type” (non-IgE mediated) food allergies. Immediate type food allergy causes the typical “immediate allergy reaction”, ranging from mild skin reactions to severe, life threatening (anaphylactic) reactions. It typically occurs within minutes to 2 hours of eating the food. Delayed food allergy can make eczema worse, however food allergy is only rarely a trigger for eczema on its own. It is controversial whether there is any link between food allergy and migraine, the tension, fatigue syndrome and hyperactivity. Foods (such aschocolate, red wine, yeast extracts and hard cheeses) can trigger migraine through a non-allergic food intolerance. Delayed type food allergies are most commonly to cow’s milk and soya, but can occur to many other solid foods. How is delayed food allergy diagnosed? Unlike immediate type (IgE mediated) allergies, where skin prick tests and/or blood tests (which detect IgE antibodies to various foods in the blood) may be useful, there are no useful laboratory tests for a delayed type food allergy. The diagnosis of delayed type allergies relies on stopping to eat that food for a few weeks. If symptoms go away it is then critical to reintroduce that food to prove that symptoms come back. The reason that a reintroduction challenge must be performed is because the symptoms of delayed type food allergies come and go, and it may be coincidence that symptoms happened to get better when a food was removed. This is NOT the same as a food challenge test done for immediate type reactions. Because there is no risk of an immediate severe reaction, it can be just reintroduction of a normal portion of the food, and does not need to be done under special conditions. Remember that “elimination-challenge testing” is not done lightly! Avoiding any food, even for a short time may be difficult, expensive and lead to minor or major nutrition issues. It is always important to have a dietician trained in allergies to guide the process, and this is mandatory when more than one food is involved. In some types of delayed food allergy a biopsy specimen of the gut may be required. At the same time it is essential to provide a balanced diet with enough protein, energy, minerals and vitamins. A qualified dietician may be able to guide the patient on how to ensure this. Unlike immediate type food allergy, delayed food allergy cannot cause a severe anaphylactic reaction. However symptoms may vary from mild to very severe. The severity of the symptoms will determine whether the person should wear a medic alert bracelet and have an action plan. Antihistamines and adrenaline is not the correct treatment for a delayed type reaction … an individualised plan should be drawn up by the doctor. Occasionally if the recommended diet is not providing adequate symptom relief, medication may have to be added. The medication depends on the major symptoms and underlying condition. What is the long term outcome of food allergies? Different types of delayed food allergy have different outlooks. Some resolve quickly and have little long-term impact, others can be controlled with diet or medication, and still others can be extremely troublesome with little relief. It is important for the allergic patient to be monitored regularly by a doctor who has specialist training in allergies. This will allow them to check whether the patient is able to follow the diet correctly and whether the diet is adequate for their nutritional needs. If the doctor feels there is a chance that the allergy has been outgrown after a long period of avoidance, it is important to reintroduce the food carefully. An immediate type food allergy may develop when that food has not been eaten for a long period. The first time that food is eaten must be as part of a controlled food challenge done in a clinic or hospital with the same protocol used for immediate type food reactions (See food challenge tests).